What more could one ask for than the perfect retreat center, the best classroom ever and an amazing store right across the parking lot? And, best of all, we had 3.5 beautiful days together. This class was one of the most stimulating I have ever taught. Check out these designs in progress. The first day students worked on drawing their designs, after working through some design exercises to help them become familiar with the various fillers that are used most frequently. 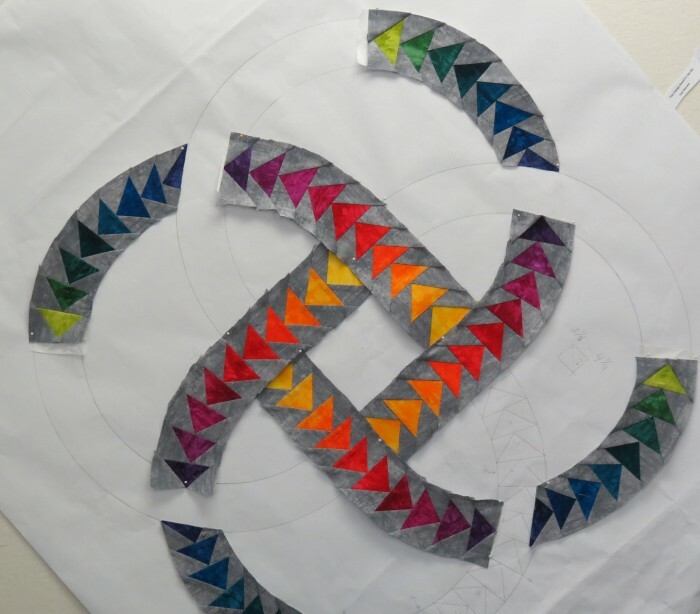 Above, Gail Barnett came to class with the idea to make a Celtic knot. In this image you can see the pieced flying goose strips overlaid atop her drawing. 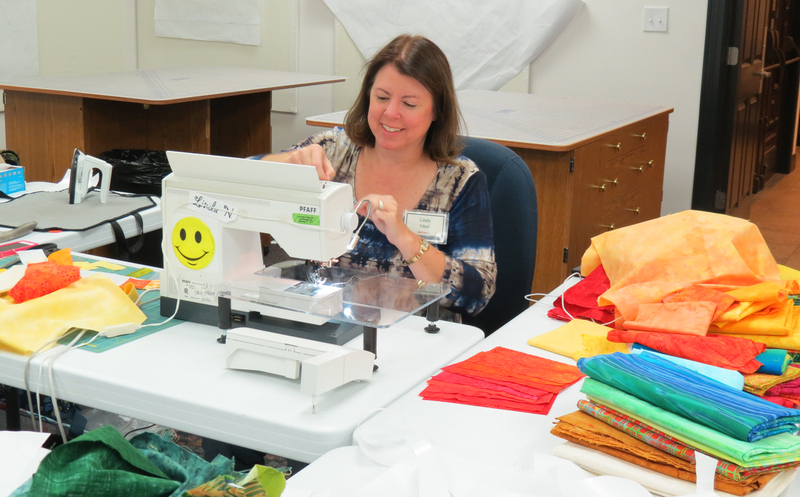 Gail used a 20 Fat Quarter pack of Starr Designs hand-dyed fabric to achieve the rainbow run. Each student had three full tables to themselves in the brightly lit classroom at The Main House at Creations. It’s always the quiet students who breeze along. By day two of class, Denise Williams had already completed this original design compass which will become the center medallion in a larger quilt for “Stars and Stripes” for the Quilts of Valor Project to donate patriotic quilts returning military men and women. 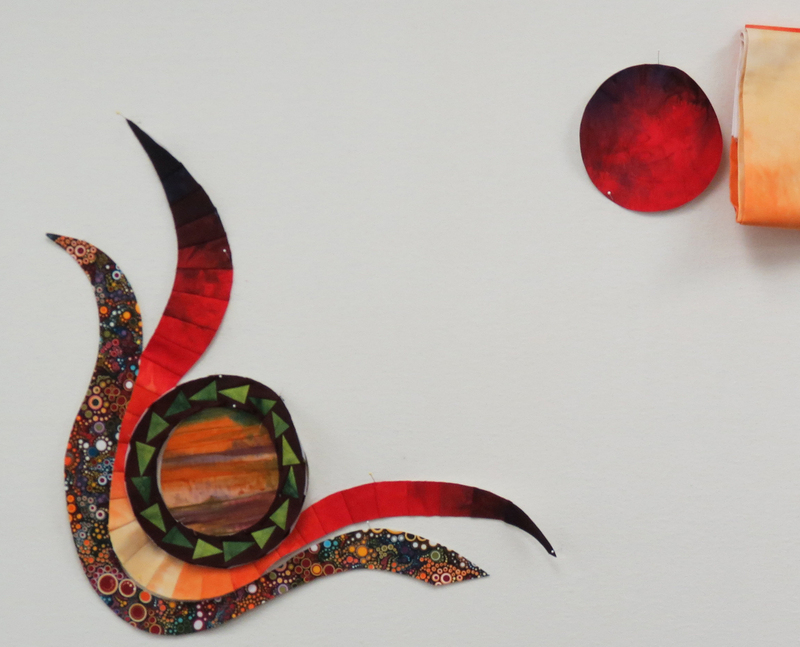 Fran Doyle, one of two Aussies in this enthusiastic class, was working on a setting sun with a Pointy Dude border across the top of her design. Pat Corcoran was inspired by the bright print with the colorful circles. She used two different pieces of a commercially dyed gradation fabric for her color run. 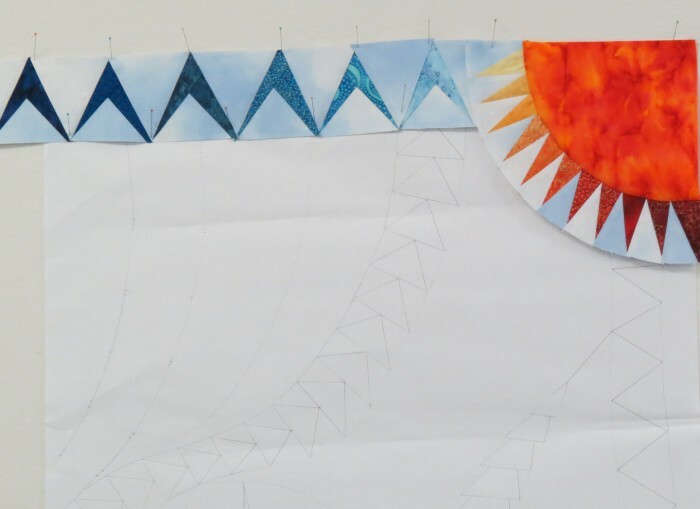 As expected, no one finished their designs in class, but each student was well on their way. 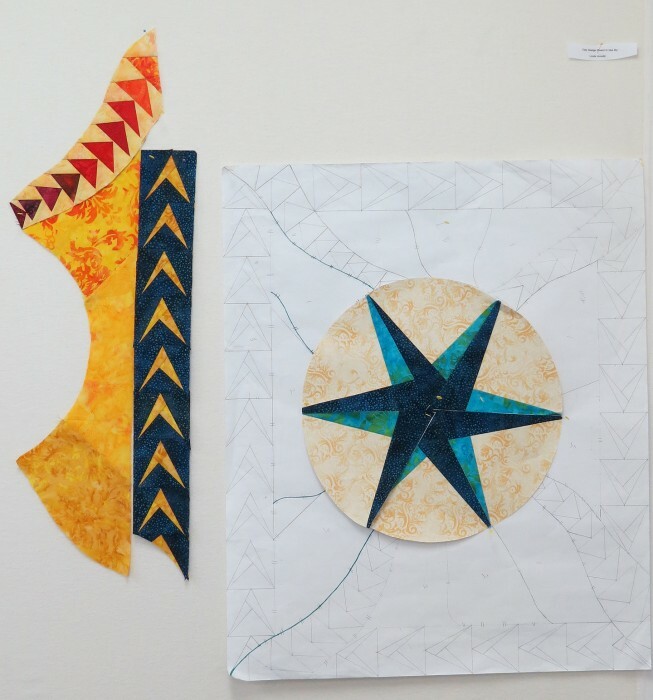 Mary Allen created this asymmetric star and was auditioning fabrics for the surrounding border. Marie Robinson was the other Aussie student. The above image shows the mirror image created via paper foundation piecing techniques. Marie and Fran, both temporary Houstonians and close friends, were charming and fun to be around, with entertaining stories about life in Western Australia. 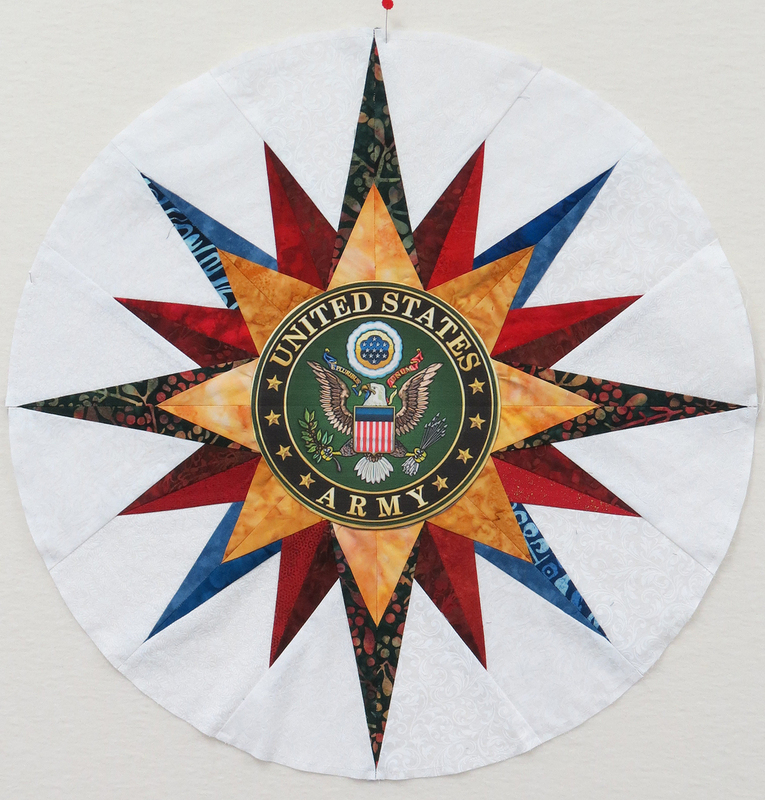 In Linda Arnold’s design above, it is easy to see the paper design as it developed in fabric. The finished quilt top is always a mirror image of the drawing unless one works to reverse the design. 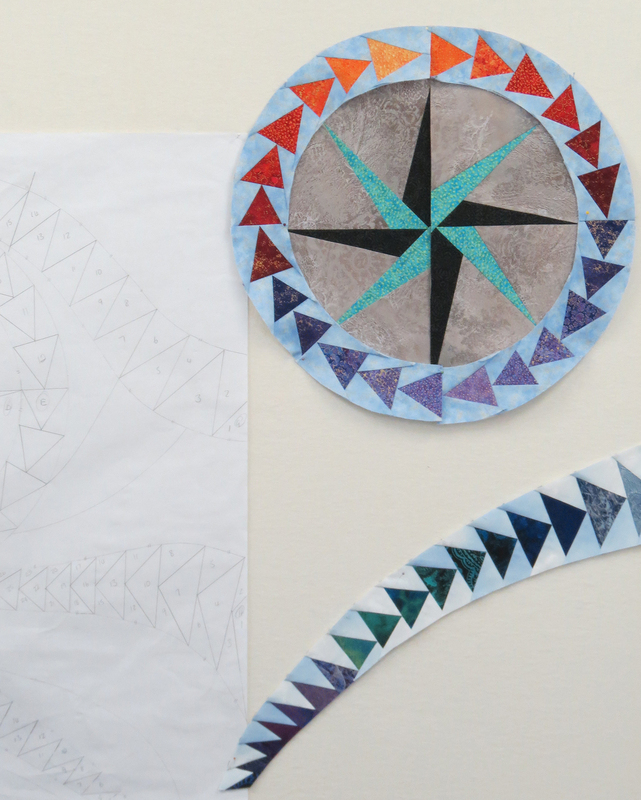 Kate Premeuax, a former art teacher, drew an ambitious design that will become a triptych. 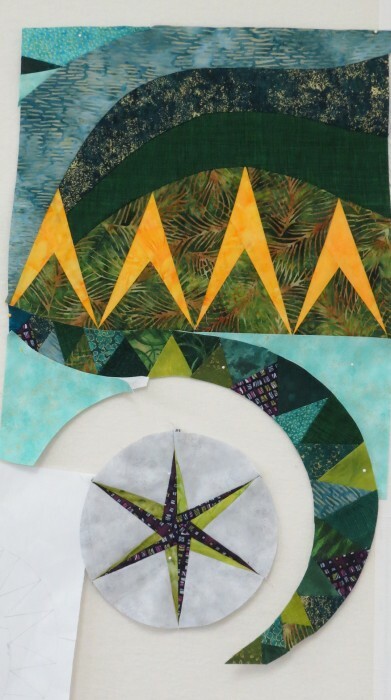 It will be three separate quilts that all share an overriding theme. 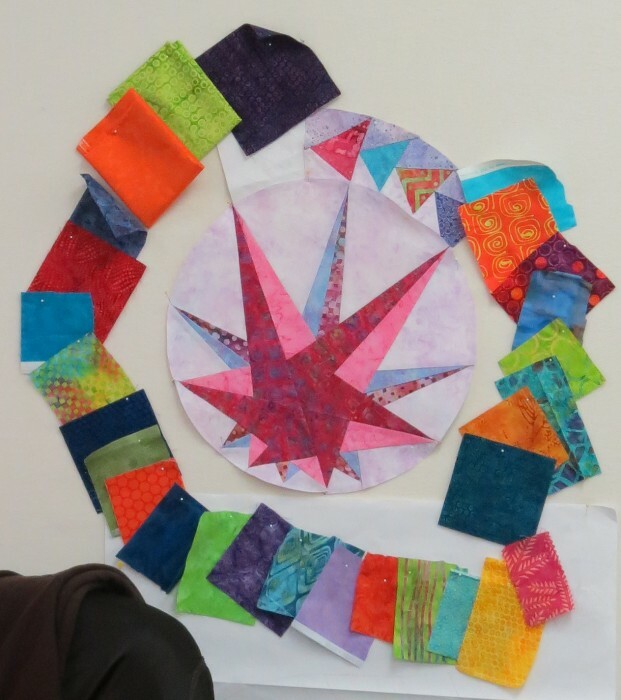 I can’t wait to see this and all the other quilts that will come from this class. Additionally, I have several new friends. We are all meeting for dinner one night at Massa’s, one of my favorite Houston restaurants, during International Quilt Festival next week. So much fun these classes are. If you have a chance to take a multi-day workshop, I highly recommend The Main House at Creations. Check out their upcoming schedule. Thank you Barbara Quinby, Julie Milam and Kathy Thompson for making this trip possible, for having such a wonderful shop and retreat center, and for your wonderful hospitality! Now, I am off to Paducah, to teach another three day class at the National Quilt Museum. Paducah, City of Crafts and Folk Art, here I come!